The genetic improvement of sugar cane is geared towards the development of new varieties with high cane yields, high sucrose content, resistant to the major diseases and pests, adapted to the various agro-climatic zones of the island, and suitable for harvesting at different periods of the milling season. Varieties should also demonstrate good ratooning capacity, are suitable for mechanized harvest, and also have suitable morphological attributes, high population density, good germination potential and efficient canopy cover. 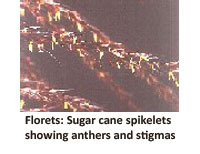 In the context of the new strategic plan for the sugar cane industry, increasing interest is also paid to the production of high sucrose and early-ripening varieties, to the exploitation of total biomass and to the development of high fibre varieties for electricity generation and ethanol production. The MSIRI maintains around 2000 parent-varieties including original species and allied genera, most of them have been evaluated and characterized for important morphological and agronomic traits. Around 1800-2000 crosses representing about 450 genetic combinations are made every year, from May to July, in crossing glasshouses under controlled conditions. The choice of parent varieties are based on knowledge on the floral biology of the plant, the genetic control of characters of importance and the breeding value of parent varieties and their combining ability. Seeds produced each year are sown to produce a new generation of 66,000 genotyes, each representing a new variety. The institute also maintains a dynamic variety exchange policy with foreign breeding stations. Foreign varieties are evaluated for adaptation to local conditions. Broadening of genetic base using Saccharum species and species of allied genera. Biomass breeding and the creation of varieties with high fibre for generation of electricity and ethanol. Since its creation in 1953, MSIRI has released a total of 64 varieties of which 52 have been produced locally and 12 foreign ones that had been evaluated for adaptation to local conditions. MSIRI (2004). M 703/89 (NCo 376 x NA 6390): an early-ripening high-yielding variety released in 2004 for early and mid-season harvest for the superhumid B-soils. Réduit: Mauritius Sugar Industry Research Institute. 4 p.: 6 figs. (Notes on newly-released sugar cane variety; 10). In 2008, a total of 24 varieties are recommended for planting in diverse environments. Services in Applied Statistics and Information Technology (IT) are also offered for processing breeding and selection data and for the institute globally. Both human and technical resources are provided to facilitate the efficient use of technology to meet the goals of the Institute and to foster an environment that allows IT to grow. Presently the local area network consists of more than 100 PCs, a network server, a database server and a mail server. Statistics and biometrics research support service are provided for a wide range of biological sciences.